Your accommodation in the immediate vicinity of Zurich Airport – for stays from two nights to a maximum of one month. Our Hotel Suites in the center of Glattbrugg combine the individuality and independence of your own apartment with the service and advantages of a hotel. We offer you a high level of comfort at reasonable prices. All suites have a separate living and sleeping area. 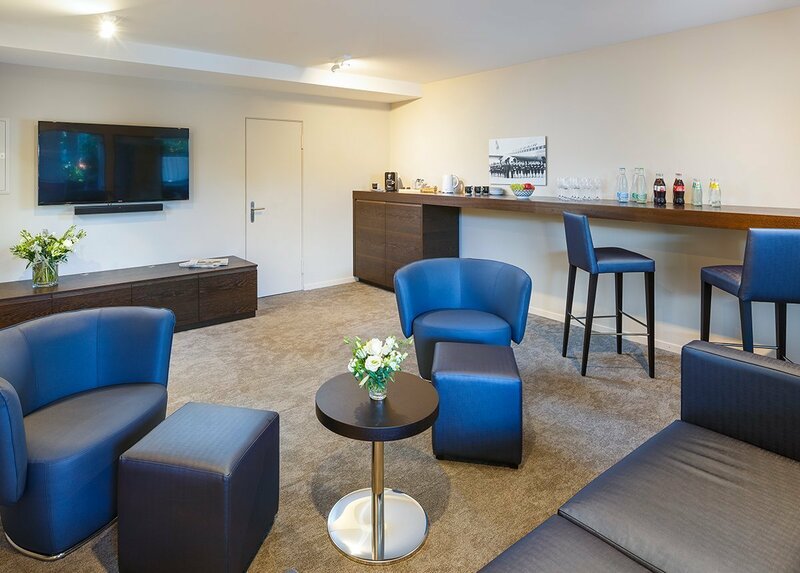 The living area has a comfortable sitting area with a 40-inch flat screen TV and a fully-equipped kitchenette which includes a pod coffee maker and a large refrigerator with a freezer compartment. The spacious table offers enough space for eating or working. The sleeping area includes a box-spring bed, a 32-inch flat screen TV and a closet. The standard equipment includes free WLAN, a room safe, bathroom amenities, hair dryer and slippers. Get an overview of our hotel suites and our services. In our partner restaurants in the main building you can enjoy Japanese table grill specialties and a wide selection of the best of Asian cuisine. Please note that our reception desk is not open 24 hours a day. If you have any questions about our hotel suites, please contact us via e-mail. We look forward to hearing from you! In addition to the lounge atmosphere, you will find soft drinks, hot drinks, fruits and daily newspapers free of charge. The lounge is located on the ground floor of the main building and can be accessed with your room card at any time.